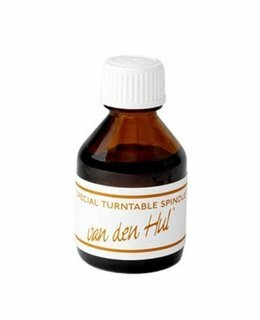 This high-tech oil is suitable for all non air-cushioned metal-to-metal turntable bearings and is supplied in a 20cc bottle with brush. The oil is doped with microscopic 1 micron diameter zirconium oxide marbles which act as an extra rotating separation between the spindle and the bearing bus, and there are so many marbles that there is no direct mechanical contact any more. This flotation property in effect minimizes bearing noise and produces the best audible quality. The friction between the bearing’s metal surfaces furthermore is reduced to just the viscosity of the oil, which is stable and highly temperature independent. This oil is suitable for high clearance bearings. 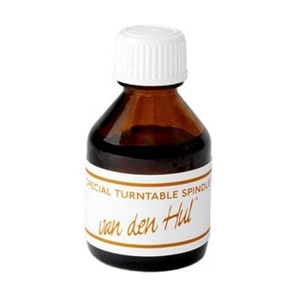 For tight clearance bearings use van den Hul TLF I or -II oil.